This was a portrait taken of "Bear" a yellow labrador from the Las Vegas Labrador Rescue in Las Vegas, Nevada. This is my personal dog and the inspiration behind the logo of Bark Gallery. He is a dog model in the sense that for a brief moment before I throw his ball, he lets me snap a few photos. Wolf in the Wild West. Dew is a husky that was born into rescue. Dog photography is often about finding a unique element and adding into the scene. I love the way this turned out. I love photographing puppies. They are full of fun and love to be in front of the camera. This was a fun studio portrait of "Crash". It was used for the families holiday cards. Crash has a wonderful personality and loves people! Labradors are one of my favorite breeds, to photograh. This is Zach. He had a studio to you session to celebrate his new home in Las Vegas. He is a yellow Labrador with great energy and loved having his studio portrait taken by Rick Vierkandt. This is Fred, he was a service dog in training from California. Here for a short amount of time we spent a few hours enjoying the Las Vegas strip and taking photos. Fred graduated service dog training and now lives with a special needs boy. Fred's pet portrait was taken in the Venetian in Las Vegas, as he was allowed a few places most dogs would not typically be allowed for pet portraits. This was a Bark session in California, as this bonded Labrador pair laid down they crossed paws! This photo is one of my all time favorite images. This labrador pair was loving and very fun to photograph! Frankie is a wonderful boy. He was rescued in California and lives the life going to work with his parents every day. His coat was really matted down when he was rescued and he needed some grooming, now he has bounced back and is doing wonderful. This is one of those days in pet photography that really makes me smile. I was trying to position the puppies in the bucket. I put two puppies in the bucket, this little guy decided to stand on his brother. This was his look when he was trying to crawl out. What a face! Love this photo. This boy had such a wonderful demeanor, dogs like this boy are unique and always are a blast to photograph. A studio portrait of Michelle Velez a local television reporter. This was a fun session and her dog has such a serious face. This Bark Gallery photo session was a lot of fun. The dog was focused and clearly in love with his dog mom. I love puppy sessions. It is always a lot of fun to photograph puppy portraits. This litter was very expressive and had great focus. Pet photography is often a lot about being patient and looking for opportunities like this one for a great photo! This cute litter was rescued by FUPI in Las Vegas, NV. They have quite the following and Bark Gallery was able to photograph them numerous times for various pet advertisements and commercial purposes. They all have such wonderful personalities and you will see a lot of photos of this group! This is the photo that I captured right before I ended up getting a face full of puppy love! Yogi is a wonderful puppy and his studio session was captured pretty easily. I love when I get the chance to photograph dogs in another state. It's nice to get different looks. This was taken at the end of a session, the dog got a reward to play in the ocean. Senior dogs often have the best demeanor of any pet. They are usually fairly calm, and love showing attention. I was looking for a spot to really showcase the face, the rounded river rocks really pull that off. This particular Bark Session was one that resulted in several very large wall portraits. 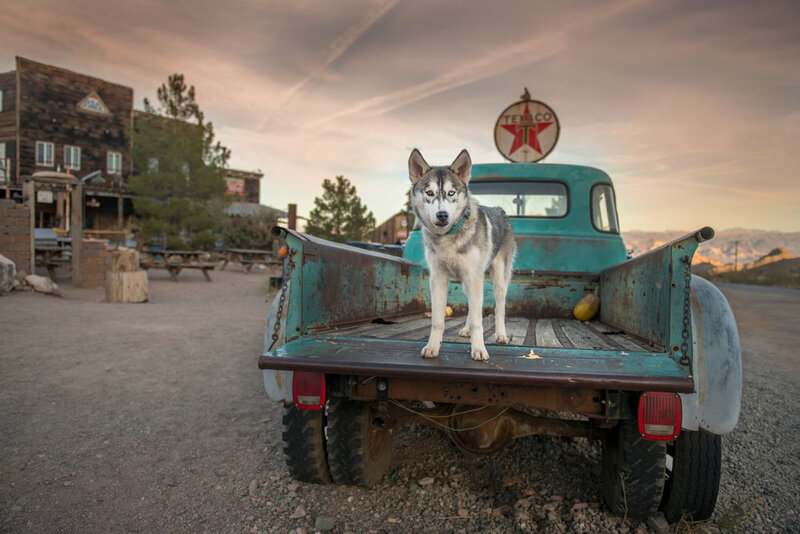 This was a fun Bark Gallery session at Red Rock Canyon in Las Vegas, NV. "Charlie" has a great personality, and was a fun dog! He was very excited to be out with his family getting his pet portrait taken by Rick Vierkandt of Bark Gallery. This image was a lot of fun to capture. This was for a Bark Gallery session and this man clearly loves his dogs! This dog is clearly focused. He is a ball crazy labrador and was intense in his pet portrait by Bark Gallery. Is that catnip I smell? Kittens are always a fun time to photograph. The markings and the colors of these cats when they are full grown is impressive. Love the look of the wild feline. I can't say enough what one of my favorite breeds of dogs are. I volunteer with the Las Vegas Labrador rescue, helping save labradors and find suitable homes for them. This image was used for a cover of the Las Vegas Pet Scene. Mikey was adopted from the On My Way Home Dachshund Rescue. Love his smile and he has one of the greatest personalities ever! Cats are something that I photograph not as often as dogs. This was a rescue litter that I photographed for Las Vegas Pet Scene magazine. This wonderful image was his first studio portrait. He loved the little squeek, and would tilt his head back and forth! Good Boy Kingston! Family pet portrait. Love the expressions! Had a wonderful time photographing the macaws at this session. What wonderful colors of this beautiful bird! "Puzzle" What a fun puppy. He has a great personality. This was a quick portrait I did on a whim the first day that I met Puzzle. You will notice additional photos of him as he is a great dog! Flirt's session on the beach in California. I love this tree in the park. It's unique and has some interesting lines for photography. This dog was able to get up on the branch with no issues and it lends for an amazing portrait. This was from a travel session in Iowa. I was photographing this labrador for a while and he was such an amazing dog. You have to love his smile. This was taken on the only trail in Zion National Park that dogs are allowed on. Jet and Bella had leashes on that were removed in post production. I love the mountains in the background and it's a wonderful area for humans to enjoy! So when I have an outdoor Bark Gallery session, I often try to include some action photos of the dogs playing. This was towards the end of the session and what I love is that you can see the slobber coming off the ball! This is clearly one of my favorite locations in Las Vegas to photograph at. This is taken at Red Canyon. Every time I go to Red Rock Canyon with a dog I am excited. The opportunity for unique images are endless here. Have you ever been to Red Rock Canyon in Las Vegas, NV? Dew and Shady enjoying the sunset in the desert. I love when we actually have clouds for portraits. I love photographing at Red Rock Canyon in Las Vegas, NV. Dogs just pop against the red rock background and make for wonderful portraits.